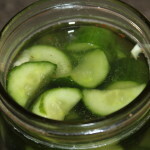 Overnight Garlic Pickle Recipe - Quick And Delicious! Overnight Garlic Pickle Recipe – Quick And Delicious! Do you ever have a few cucumbers left over that you don’t know what to do with? You might have made pickles, salads, eaten every other one directly off of the vine, and have given so many to your family and friends that they avoid you when you come by with a full grocery sack of produce. Or, maybe you aren’t quite ready to try your hand at canning pickles, but thought you needed 3 cucumber vines this year and don’t know what to do with them all. For pickles – use cucumbers that are 3-5 inches in length. Don’t worry – this overnight pickle recipe just might be the perfect solution. It only takes a few minutes to prepare, there is no canning required, and by the next day, you have fresh pickles ready to devour! The secret to having crisp pickles for this recipe is threefold. You must start with freshly picked cucumbers. Soft cucumbers equals mushy pickles. 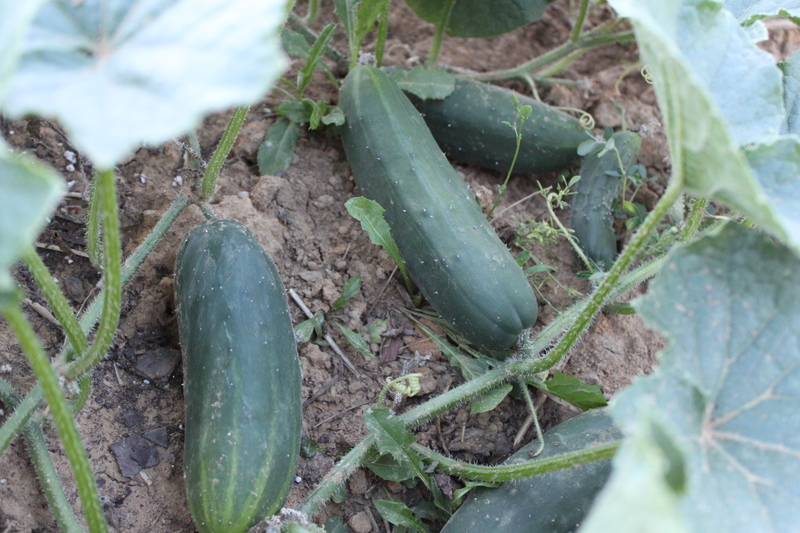 You must also pick the cucumbers when they are small (3-5 inches are ideal). Leave the large or long cucumbers for your salads – they have too much water content and too many seeds to produce good pickles. You can leave your pickles whole or cut them into slices, spears, or chunks – it really is up to your preference. 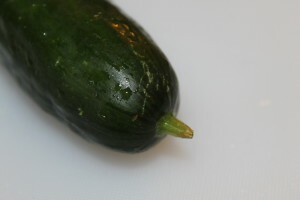 This is the cucumber’s stem end – typically larger than the blossom end. The blossom end will have a small and rougher divot. One hint of advice though – make sure to cut off the flower end. This is the end where the cucumber blossom emerged. If you buy your cucumbers from a farmer’s market or store, look for the end that has the bumpy dot – not the smooth, indented dot. Cut off 1/16th of an inch to avoid any remaining enzymes that might cause your pickles to become soft. And one last bit of advice — make sure to use pickling salt or pure kosher salt. 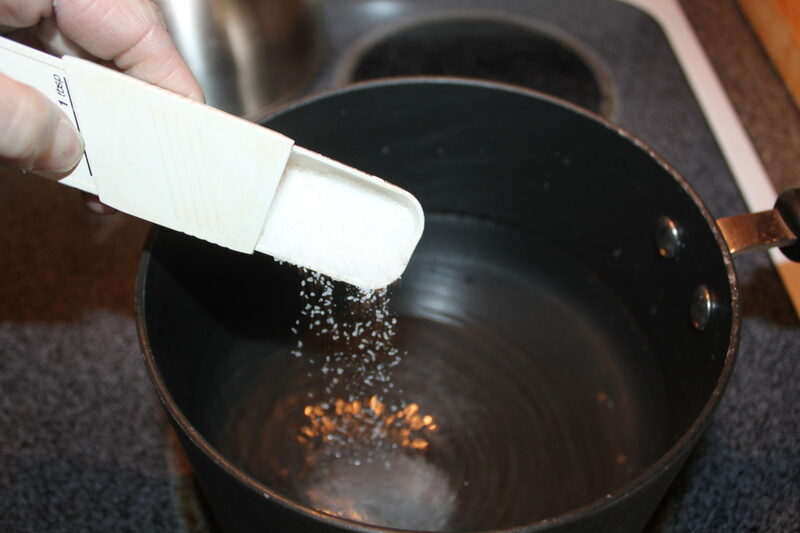 Do NOT use iodized salt that is found in most kitchen cabinets. The reason: iodized salt is not pure sodium chloride – there are several additives to allow for an extended shelf-life which includes glucose and calcium silicate which is an anti-caking agent. This changes the chemical make up of ‘salt’ and thus can effect the texture, color and taste of your pickles. Stick with the pickling or pure kosher salt – they are easy to find in your standard grocery store. Slice your cucumbers however you desire for this recipe! You must use pickling or pure kosher salt – no iodized salt when making pickles. 1. Place water and salt in a medium sauce pan. Heat on medium low heat, just until the salt has dissolved. 2. 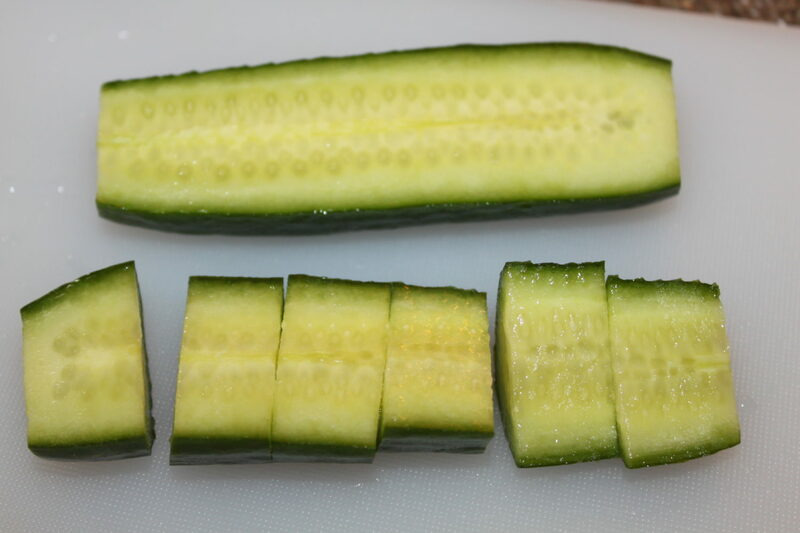 Slice cucumbers to your desired length. 3. Crush and roughly chop the garlic. 4. 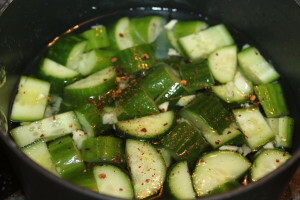 Add cucumbers, garlic and red pepper flakes (optional) to the water. Place cucumbers, garlic and red pepper flakes in the brine. 5. Place mixture into a bowl or jar. *You want the pickles to be emerged in the water. You will need to place something on top of the mixture to prevent the cucumbers from surfacing to the top. 6. Place mixture into the refrigerator – let sit overnight. Place water and salt in a medium sauce pan. Heat on medium low heat, just until the salt has dissolved. Slice cucumbers to your desired length. Add cucumbers, garlic and red pepper flakes (optional) to the water. Place mixture into a bowl or jar. *You want the pickles to be emerged in the water. You will need to place something on top of the mixture to prevent the cucumbers from surfacing to the top. Place mixture into the refrigerator - let sit overnight.